Dogen Zenji does not say just wholeheartedly sit on a cushion. If you believe in just doing that, place a rock on a cushion and let it sit. It sits better than we do. Is that enlightened life? We should not fool ourselves. 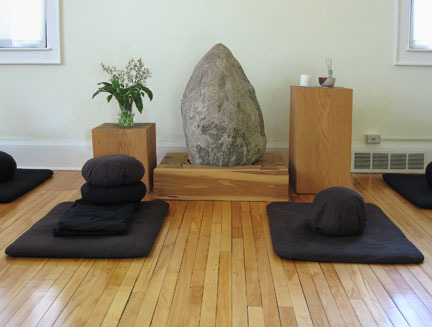 The photo is of the altar in the zendo at Dharma Field Zen Center in Minneapolis, where I occasionally attend. The rock supplanted a statue of the buddha, in order, according to Dharma Field head teacher Steve Hagen, “to not confuse people” who react strongly, whether reverentially or negatively, to religious iconography. One matter is clarified by sitting in this space- it is as Maezumi says, the rock sits better than we do. This entry was posted in non-music writing on May 2, 2010 by jessewgoin.